Not just winning the first prize at Melco Start-Up Challenge, Botbot.AI is to collaborate with Melco. Macau, January 24, 2019 — Botbot.AI continues to make waves in 2019, this time with the Melco Start-up Challenge, in collaboration with Microsoft Azure. Melco Resorts & Entertainment Limited (“Melco”) is a developer, owner, and operator of casino gaming and entertainment casino resort facilities, in Asia. The organisation was looking for disruptive start-ups that could help improve all aspects of their value chain and increase efficiency. The jury comprised Melco representatives from various departments, who were primarily looking for uniqueness, value creation, roll-out potential, general traction, financials, team and advisors. Jia Chai Low shines on stage, talking AI, chat, and human efficiency. Botbot.AI representative, AI enthusiast, and VP, Business Development, Jia Chai Low participated in all categories – Travel Tech, Retail & Hospitality, Operation Management, Added Services, and Customer Success, presenting a 5-minute pitch on the benefits of AI Chatbots for all. The pitch included case studies of past work, current progress, and future applications, keeping in mind that everything is ultimately to solve the underlying problem of underemployment. His efforts paid off and he returned triumphant, claiming the top spot for Botbot.AI and winning USD 6,000, USD 1,000 worth of Azure credits, and 3 PoCs, worth USD 50,000 each, with one being guaranteed. The team believes in making the mechanical less cumbersome and more conversational, adding the much-needed aspect of accuracy in AI. Its past experiences and projects have validated its hypothesis that chatbots can augment human effort in many key industries, making all that we do count for more. It is now widening its repository of chatbots, each with custom workflows and lexicons, hoping to ultimately become the automation solution of choice for dynamic, innovative organisations of the present and the future. If you’d like to continue the conversation and find out how your business can be transformed, please call +65 6222 2359 or visit the company website. For a free copy of the company’s introductory deck, please email [email protected]. Botbot.AI was recently recognized with two prestigious Artificial Intelligence Software awards by FinancesOnline, an independent SaaS review platform. The Artificial Intelligence Software awards were given after their experts meticulously inspected all functionalities of our productivity and chatbot solution, highlighting its exceptional multilingual and multichannel prowess for automated conversations, robust pre-configured intelligence for business-specific queries, and highly adaptable machine learning capabilities. This allowed us to receive their prized Great User Experience and Rising Star awards for 2018. Both awards delivered by FinancesOnline under their best artificial intelligence software highlight Botbot.AI as a reliable and hassle-free solution for optimizing your workflows, driving productivity, and accelerating client communications. In their Botbot.AI overview, FinancesOnline was impressed with the intelligence of our bots, stating that it “understands and learns your customers’ messages, intended purposes, and more.” They also underscored its effectiveness in eliminating time-exhausting tasks, thus, “decreasing the need for real agents to cater to menial and common transactional conversations” so they can focus on more complex conversations. Overall, FinancesOnline believes our AI technologies are among the leading solutions on the market due to Botbot.AI’s unparalleled intelligence in answering all types of queries, while also being able to learn from all interactions for better communications. Visit FinancesOnline for their full thoughts about Botbot.AI. You can also leave a user review on their website to let us know how our platform improved your customer communications and work productivity. Read more on the problems they faced and how chatbot has improved their productivity. 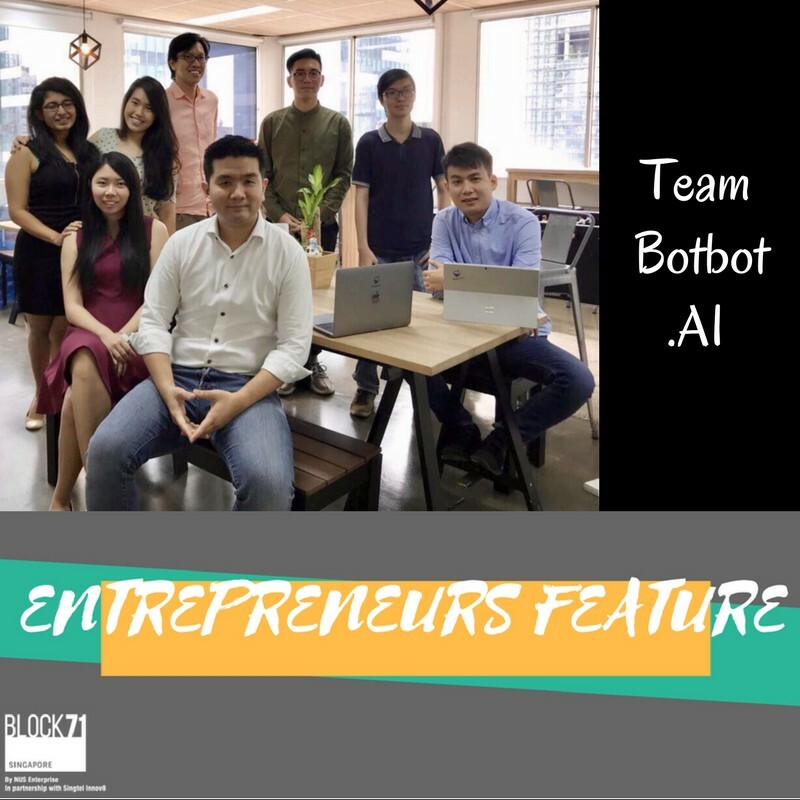 In this week’s Entrepreneurs Feature, we speak to team Botbot.AI, an enterprise productivity solution that uses chat as an interface to automate business processes and optimize workflows. Botbot.AI is currently incubating with STARTUPAUTOBAHN Singapore, a corporate co-innovation platform powered by Mercedes-Benz focusing on several domains including Customers, Automotive Retail, Aftersales, Corporation and Infrastructure Management. 1. What is Botbot.AI and how did the idea behind it come about? Botbot.AI is an enterprise productivity solution that uses chat as an interface to automate business processes and optimise workflows. Our team has been building enterprise systems and solutions as part of 2359 Media for the past 9 years, but after realising that many executives still defaulted to chat as a way to get things done, we decided to build systems that used chat as an interface and a platform for work to be done. At the heart of our business, we are always driven by our principles of maximising human potential by automating transactional, menial and repetitive work so that people can do high-cognition, high-value work. Boosting enterprise productivity and elevating the level of engagement in our workforce are the ways in which we quantify our success. 2. Where do you see Botbot.AI in 5 years? Botbot.AI in 5 years would be the automation solution of choice for dynamic, innovative organizations of the future. We’d be solidifying our APAC presence through expansive acquisitions and partnerships, and creating more engagement throughout the workforce by automating low-value work and maximising employee potential. Ideally, we’d also be running our very own CSR programmes to help research, contend with and execute solutions to underemployment, as well as our very own fund to help employees jumpstart new ventures of their own. This is something we’ve always wanted to do, and the vivid vision of us being able to achieve that drives us every day. 3. What differentiates Botbot.AI from its competitors? Botbot.AI was built with the Asian enterprise in mind, which led us to building chatbots that could reach people on a platform that they’re familiar with, in a language that they’re comfortable in. The optimisation for language creoles across a wide range of Southeast Asian languages and platforms commonly used by locals, allowed our chatbots to be learned and adopted by users quickly. With our intentional practice in building chatbots that failed faster and failed better, we realised that chatbots were just the interface — the real capabilities came from the automation that happened once we connected these interfaces with real-world working systems. As such, we began pre-training chatbots in certain target industries, especially in back-office functions and HR. This meant that companies could buy our solution off-the-shelf and require minimal customisation for it to be enterprise-ready. Of course, this meant many hours poring over processes from different clients, but now that we look back, that particularly arduous exercise was worth the time. 4. How did Botbot.AI build its customer base? The team from Botbot.AI hailed from a software house that had already begun to delve deep into enterprise mobile apps, and as such, we already had existing expertise in understanding, dissecting and analysing all sorts of enterprise workflows. This knowledge had us running as soon as we hit the ground, because our first client was a global FMCG that wanted to employ chatbots as a vehicle for knowledge transfer and neonatal education for parents-to-be. Since then, we’ve come a long way: from financial back-offices to food delivery, from conglomerates to cafes, we now serve a diverse range of business needs and clientele, and we’re constantly surprised and excited by the dynamism of our projects! Ultimately, we believe that enterprises are always looking for new ways to communicate with their clientele and their own employees. Just like the website was a channel of communication at the advent of the dot com age, we foresee that chatbots will be a new medium through which companies can engage clients, both internal and external, more effectively and efficiently. 5. How do you measure the success of your start-up? We do have revenue targets, lead generation goals, even hiring objectives, but at the end of the day, what success truly means to us would be creating real impact by enhancing business processes and augmenting human productivity. If we had to put a number on it, we’d say that if we managed to automate 1 billion conversations, and we do really have a counter for this statistic, we’d pop ourselves some champagne and celebrate! 6. What are the benefits of joining the Start-up Autobahn accelerator programme? Startup Autobahn gave us a very unique opportunity to look at the automotive industry. It’s one of the industries that we’d always been very interested in but never really had the network to reach out to. We’d say that the accelerator has given us the network, connections and exposure and built confidence in what we’ve built for automotive use cases. It’s a form of validation, you could say, that our product can be applied across a variety of heavy industries and sectors and still perform. We weren’t so confident of that ourselves initially either! 7. What was your most memorable moment in BLOCK71 Singapore? The networking and introductory sessions at BLOCK71 have given us the opportunity to interact with startups that are tackling some very riveting problems, and being surrounded by such company does inspire us to take our innovation to the next level too. We have chatbots with different use cases, and we’ll let you try the one most relevant to you. Productivity across Singapore has been struggling for years. Even though it has gone up over Q4 2018 based on flash estimates, it is due primarily to an upswing – there is some slack so companies can increase capacity without needing to hire. With labour cost going up, the way forward could be to leverage on another level of enterprise automation. For Wong Hong Ting (CEO/Founder of Botbot.AI), that comes in the form of a chatbot creation platform. 1. Please share with us briefly what you do. I’m CEO & Founder of Botbot.AI, a chatbot creation platform that focuses on creating bots to increase enterprise automation and productivity. Specifically, we have ready to deploy bots in various business functions, such as HR, finance, trading back office, facilities management and, of course, customer service. At the heart of our business is our desire to tackle underemployment and employability. 2. What were you doing before this? For the past 8 years, I’ve co-founded and run 2359 Media, a software house that works with digital innovation teams within MNCs, GLCs and selected startups to create new mobile and cloud-first products that help them to serve their customers and organisations better. In 2009, mobile wasn’t popular (yet! ), but with everyone beginning to acquire mobile devices of their own, we felt that it was a matter of time before it became commonplace, and thus embarked on creating mobility solutions that would transform the way people live and work. 3. In one sentence, how would you describe what your product does? Botbot.AI deploys chatbots for workflow automation in enterprises, tackling menial, repetitive and transactional low-value tasks so that people can move to higher-value, high-cognition work — therefore driving productivity for enterprises and re-engaging our workforce. One of the driving forces behind why I do what I do would be the aspiration of being able to maximize human potential. Underemployment and employability are problems that I hold close to heart, having mentored many youths and seeing firsthand how much time they spend on low-value work that doesn’t advance them in the least. That made me want to find a solution that would not only rejuvenate them but also, make them generative unto the workforce. On the business front, conversations with other entrepreneurs in Entrepreneur’s Organization (EO) over the past 4 years has surfaced the extensive paperwork and processes that PMETs face on a daily basis — and how bogged down they are by it. The time cost and labour cost of these processes all seem necessary and unavoidable (even for the SMEs) but can actually be eased by intuitive, intelligent automation. On the other hand, there are also organizations which have integrated technology into their workflows. The irony is that whilst enterprise softwares have advanced our businesses greatly, with each software comes a steep learning curve, and at some point, we find that these complex systems have become white elephants within the organization. We’ve built many such products and we found that people still default to chat to get things done — that led us to build Botbot.AI. With chat as an interface, we hope to reduce the barriers to adoption, and truly allow enterprise software to power productivity, not stand in its way. Botbot.AI takes in conversations from a multitude of interfaces (e.g. Facebook Messenger, Slack, Skype, Telegram, Alexa – basically any chat platform or web/mobile app), understands what the user is asking for, and triggers the necessary workflow in enterprise systems. When we engage users on a platform they’re comfortable on, in a language they’re familiar with, they can forget about learning new interfaces and just focus on getting work done. With deep integrations into enterprise systems ranging from HRIS to procurement portals, time and effort from menial tasks like checking payment statuses, form-filling and conducting trades can be greatly reduced and redirected to higher-value work. Once we’ve got the execution down to a T, the organization also finds that they can tap on a new, rich source of data — conversations — to drive informed business decisions on issues ranging from supply & demand, financial trading to performance reviews. 6. What are the key benefits that your product brings? Botbot.AI empowers organizations with the ability to focus on higher-value work. The rising cost of labour and operations in Singapore is indicative of the underutilization of the many university graduates we have now. Many of them find their employees suffocated by jobs that consist largely of rote work, and understandably so, but in the same breath, we’ll hear those same clients talk about how hard it is to find people with the skill sets they need for high-cognition work, like negotiations! People with the necessary skills could already be within the company, finding their time being occupied by endless paper-pushing or processes, and business owners would never know unless they could free these talents up enough to give them high-cognition work. Chatbots help to ease the labour-intensive rote work that companies find themselves mired by, and companies can then move their workforce to higher value work. 7. Who are your closest competitors? Globally, there are many companies looking into enterprise automation, which is a given, seeing as how it is a market with huge potential for disruption. Rather than pinpoint competitors on a market map, we believe that organizations need to look at how our tools might find synergy and integrate with each other to create a cohesive solution that not only works seamlessly but that employees find a delight to use. 8. Who is your first customer and how did that happen? Our first customer was a global FMCG looking to establish a research project together with a hospital on the use of chatbots for new parents-to-be. The study aimed to establish whether or not chatbots were a good vehicle for knowledge transfer and education of a market about pregnancy, and it was very exciting for us because the project gained significant traction in a very short span of time, thereby validating our convictions that chatbots could not only be a means of automating tedious workflows, but more than that, it could create immense value-add for enterprises looking for new ways to communicate with their consumers or employees. The introduction and subsequent expansion of this project into foreign markets also gave us confidence that we were taking this project in the right directions. 9. What were they using before this? Chatbots are so new in the market that oftentimes the software they were using beforehand was simply Whatsapp, Telegram or Facebook Messenger, without the security features, without the automation, and without the artificial intelligence! 10. How do you price your product? We custom build many of our chatbots, so an estimate would be SGD 2-5 / 1000 queries, excluding setup and integration costs, which differ greatly from company to company. 11. What’s your business focus for this year? We’re looking to grow into regional markets in APAC through partnerships with other enterprise software companies. The potential of our cumulative efforts that we see with these companies both inspire and energize us, and we’re all just really excited about creating products that could really transform the way people work. 12. What’s one productivity tip/app/tool you can’t live without? Todoist — partially because my team are all on it and it is much easier to delegate work on it, and more importantly, both softwares show conviction in the same empowerment that all enterprises and individuals can experience with technology! 13. Where can people find out more about your product offerings and you online? Our official Botbot.AI website and LinkedIn. First job: 2359 Media, right out of school! Favorite book: Hard Thing about Hard Things by Ben Horowitz. I don’t read fiction often, but this afforded me the sensationalism of fiction with the comprehensive strategies usually presented in business non-fiction. Favorite Film: Disney’s Hercules, because I found that its central themes resonated with me! Last holiday: Took a trip to Bali that I’d never forget, but even that was way too long ago! Get detailed insights on how we can implement chatbot in HR workflows and its results. Botbot.AI have just won the Tech Den start-up competition at today’s HRTech Summit. The start-up walks away with a $20,000 marketing campaign from Key Media in HRD Magazine and the opportunity to secure funding from investors present at the event. “I think it’s a great validation of our relevance in the HR space and we hope to augment more back-office operations through AI,” said Chelsea Sim, chief of staff at Botbot.AI. A total of five start-ups participated in the competition. Each team had three minutes to pitch and explain their solutions to a panel of three judges. The panel was made up of Yee Hoong Chow, investment analyst at Monk’s Hill Ventures, Kuan Hsu, co-founder and general partner at KK Fund, and Adrian Tan, co-founder at The Resource Group and Career Hero. The competition capped a day of thought-provoking sessions that discussed the impact of digital disruption on HR. Botbot.AI is an enterprise productivity solution that uses chat as an interface to automate business processes and workflows. Driven by our principles of maximizing human potential, we aim to move people away from low-value, menial and transactional work, leaving those to chatbots, and refocusing them on high-cognition, high-value tasks, driving enterprise productivity and elevating the level of engagement in our workforce. Botbot.AI was built for the Asian enterprise in mind, optimized for the rich range of languages and creoles as well as platforms popular within the region. We harness advancements in natural language processing (NLP) and machine learning, but that only makes chatbots more conversant on the surface. Rather, it is our comprehension of the complex systems powering each enterprise that have led us to creating chatbots that not only integrate extensively with, but also directly address and automate workflows or processes within these abstract systems. Above all, Botbot.AI taps on a rich new source of data — conversations — that bring a qualitative edge to the insights that businesses can already glean from existing quantitative data. Most enterprise softwares are limited by their adoption within the organization, and as such, our chatbots are deeply integrated with existing back-end systems to execute necessary workflows, providing utility whilst engaging users with an interface that they are more than familiar with – chat. With deep expertise in understanding, dissecting and analyzing conversations, we’ve successfully built chatbots that deal with all sorts of custom workflows from financial trading to food ordering, for clients ranging from cafes to conglomerates. Botbot.AI hopes to ultimately become the automation solution of choice for dynamic, innovative organizations of the future. Botbot.AI has seen the biggest traction in industries that rely on labour-intensive, administration-heavy processes. Our clients range from banks to restaurants and even dating agencies! 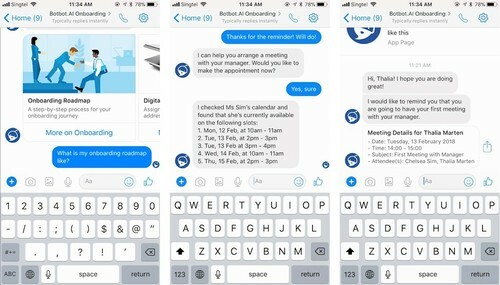 Among them, FranCIS, a Singtel chatbot that aims to provide clients with quick answers they need to specific questions that they might otherwise have to scour the website for, thus creating a new touchpoint for the brand to engage customers. Within the financial services sector, our clientele includes TP Bank in Vietnam, and in line with their vision of becoming an innovative digital bank, launched T’Aio, their fully Vietnamese chatbot, in 2017. With T’Aio, Botbot.AI has served more than 2,000 customers for their transactional needs, and have also worked with insurance companies and asset management firms to automate back-office operations. Human resource has also been an automation stronghold, and in a global FMCG conglomerate, Botbot.AI has not only enriched the onboarding process for new hires, but also established a use case as a research tool together with Alexa, evaluating the efficacy of their products in the household and recording qualitative user feedback for further enhancements. Widening our repository of chatbots, each with custom workflows and lexicons, has validated our hypothesis that chatbots can augment human effort in many key industries and make all that we do count for more. Botbot.AI hopes to ultimately become the automation solution of choice for dynamic, innovative organizations of the future and engage the workforce on a level higher than ever before. It is an enterprise chatbot solution that leverages on artificial intelligence to automate repetitive, transactional and menial tasks. Operating out of Singapore with a regional language niche, Botbot.AI aims to tackle the problem of underemployment through moving people to higher-value work. Our goal is to automate as much low-value work as we can. Our chatbots are microservices that are built for scalability, with specific products that are plug-and-play solutions for the food and beverage, human resource and healthcare sectors. The business is founded on the principles of maximising human potential. I started Botbot.AI in 2017 to transform the way that people live and work through technology, creating workplaces where people can thrive with meaningful work. How do you fill the gap in the market? The structure of today’s economy necessitates the brilliance of technology professionals who are also well-versed in business and design. We spent the past eight years building a team that can work with innovation teams in top multinational corporations and government-linked companies to architect and design innovative products that improve the way that people live and work. Armed with these rich experiences, we now build enterprise systems, business to consumer (B2C) apps and artificial intelligence systems to help enterprises increase productivity through automation of conversations or digitised workflows. In 2004, after the tsunami struck, I was involved in the Singapore Armed Forces’ humanitarian efforts in Meulaboh, Aceh. It was there that I experienced firsthand the impact that entrepreneurs could have on their community. The way that they could directly impact lives through job creation and supply of goods and services to those in need nurtured a deep desire to do the same for my community back in Singapore. During my year in Silicon Valley as part of NUS Overseas College, I rekindled my love for technology that I found at the age of nine, as I was coding my first website. When we returned, we became some of the first iOS developers in Singapore and embarked on our first startup ideas. Mobile was not popular back then, but with everyone beginning to acquire mobile devices of their own, we felt that it was a matter of time before it became commonplace. The initial days of developing SG Malls, our first mobile app, were exciting as there was inherent utility in the apps that arrived early on the scene. With traction of over 50,000 downloads within the first months of launch – without marketing! – we were even more convinced of the potential of mobility solutions, and that led us to transform our project into a proper company. What are some of your latest developments? One driving force behind why I do what I do would be the aspiration of being able to maximise human potential. Through conversing with other entrepreneurs in Entrepreneurs’ Organization (EO) over the past four years, I came to realise that many PMETs (professionals, managers, executives, technicians) are, in reality, bogged down by extensive paperwork and processes – all of which seem necessary and unavoidable. While enterprise software has helped us tremendously, the sheer number of enterprise tools available results in a huge learning curve for employees, which consequently leads to low adoption rates. This got us building Botbot.AI, a chatbot creation platform that focuses on building bots for enterprises. Specifically, we have ready-to-deploy bots in various business functions, including human resource, finance, trading back-offices, facility management, and of course, customer service. Chat within enterprises has become the biggest collaboration tool, and the automation of conversations allows for enterprise software to be adopted easily, without the learning curve that accompanies a new user interface. What does your company do to stand out and compete with its rivals? At the heart of our company are our people, and we invest in giving them a good foundation in business, technology and design, allowing us to implement solutions that create value in their businesses. As a lifestyle, we also practise rapid iteration and strive to stay on the cutting edge of technology. With a core mission of leveraging on technology to improve the way that people live and work, we do not implement technology for the sake of implementing technology – we look to engineer solutions that have high usability in addition to utility. Talent acquisition has become increasingly challenging – talents can no longer be specialised, and need to develop transferable, cross-functional skills that can empower them in both the technical and business side of things. At this moment, our journey with chatbots also closely resembles our beginnings in mobile apps, where educating the market that the adoption of this particular technology – ie artificial intelligence – will accelerate them as professionals and give them a competitive advantage, and that it is not going to take away their jobs but rather, augment them. Lastly, a happy problem: Due to the nature of how technology evolves, the opportunities and possibilities are countless, so selecting and figuring out which ones build our vision of impacting a billion lives in a shorter timeframe has become crucial. What advice do you have for budding entrepreneurs out there? Mentorship — learning and then sharing that learning – is key to growing as an entrepreneur. As the sub-committee chairman for Mentorship at the Action Community for Entrepreneurship, I make an active choice to keep investing back in the system, just as it has invested in me. It originates from the deep belief that every entrepreneur — no matter the stage in their journey – should have at least one, if not more, mentors; and at the same time be willing to mentor people who might be a few steps behind them in the entrepreneurial journey. Only then can we build a sustainable ecosystem where ideas and skills are primed to succeed — which, in turn, sets the foundation for the next 50 years of growth in Singapore. Don't miss out on the latest AI and chatbot trend. Join our mailing list and receive our latest posts via email.